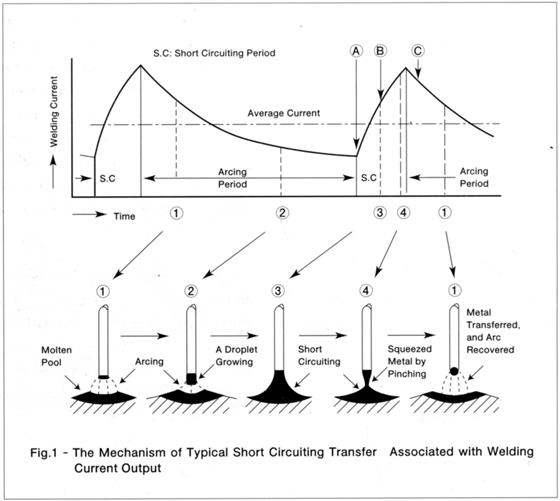 What is Short Circuiting Transfer, and What is it Used for? Both globular and spray transfer are also known as "free flight transfer," because the molten metals transfer while flying in the arc. Short circuiting transfer, however, is very different because the molten metals bridge the tip of the electrode and the molten pool in excess of 50 times per second during welding — Fig. 1. Short circuiting transfer enables the all-position welding, and features less spatter, shallower penetration, and less undercut than other manner of molten metal transfer. Because of shallower penetration, short circuiting transfer is often used for welding sheet metals in particular, in auto, rolling stock, and electrical appliance industries. The character of the molten metal transfer is largely dependent on the composition of the shielding gas, the alloy composition of｀the electrode (welding wire) and the electrical parameters (welding amperage and voltage). Among Kobe Steel's varieties of MIG and MAG welding wires, some wires are designed for short circuiting transfer welding. They offer better arc stability at lower currents for stable short circuiting transfer. Examples include MG-51T (AWS A5.18 E70S-6), and MX-100T (AWS A5.20 E71T-1, E71T-1M) for mild steel and 490N/mm2 high tensile steel.